Join us for our 27th annual spring choral concert on Friday, May 18th at 7pm at the First Congregational Church of Brewer. This year our Director, Molly Webster, has put together a program filled with old favorites and beautiful contemporary pieces that will shine a little hope in your day, including the gospel works “Unclouded Day” arranged by Shawn Kirchner, and “The Storm is Passing Over” arranged by Barbara W. Baker. We’ll be revisiting old favorites, “Omnia Sol” by Z. Randall Stroope, and “Hope is the Thing With Feathers” by Kenney Potter, (based on the poem by Emily Dickinson). Rounding out the mix will be pieces from Bob Chilcott, Moses Hogan, Steven Foster, Gerald Finzi, and even U2. We will be raffling off another basket of fabulous local items, gifts and assorted goodies, and the concert will be followed by an ice cream social. Suggested donation of $10 at the door. New Renaissance Singers invites you to join us for our 2017 Winter Choral Concert “Remembering Decembers”! Our director, Molly J. Webster, has programmed a wonderful mix of sacred and secular music to help you celebrate the season! We’ll be kicking off the performance with Thomas Morley’s madrigal “Lirum Lirum”, followed by classic favorites such as Vittorio’s O Magnum Mysterium and Javier Busto’s Ave Maria. We’ll wrap up the concert with seasonal favorites like O Holy Night, and put a new twist on Jingle Bells and I’ll Be Home for Christmas. Before and after the concert, you’ll be able to purchase raffle tickets to win a gift basket filled with some great local treats to help you unwind from the holiday season, including wine, music, massage, and more! We’ll also be hosting our annual post-concert Christmas Cookie Sale — Save yourself some baking and grab a box or plate of cookies to take to your next holiday gathering! Spring Concert on May 19th, 2017! Join New Renaissance Singers as we unite in song for our 26th Annual Spring Choral Concert! This season’s program “United In Song”, arranged by our Director, Molly J. Webster, features a walk through the history of American composers from Steven Foster to the more contemporary works of Jay Althouse and Maine’s own Andrew Hirst. The theme expands to include works from outside influences such as the Beatles and Leonard Cohen, and songs of peace and unity. Before and after the concert, there will be a silent auction of items donated by varied talents and services of our members, from a picnic basket with wine, to massage, art and handmade items, with funds raised to benefit New Renaissance Singers and our music scholarship fund. Refreshments will be provided after the concert, so feel free to hang out with us, have a snack, and bid on some great stuff! The New Renaissance Singers (NRS) will present their winter concert “Lighting Up the Season,” on Saturday, December 13, 7 p.m. at the First Congregational Church, 35 Church Street, in Brewer. Admission is by donation with a suggested amount of $10 per person at the door. There will be a reception following the concert. NRS is a non-audition, multigenerational community choir which has been performing in the greater Bangor area for twenty-four years. Musical Director Molly Webster arranged this year’s winter concert program to offer an eclectic mix classical pieces, folk songs, and contemporary choral arrangements, with an underlying theme of light and hope. 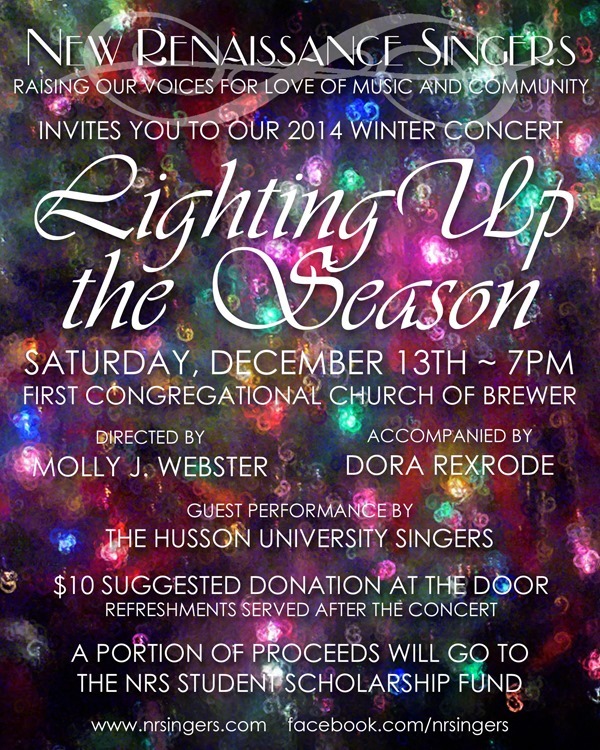 The concert will also include a guest performance by The Husson University Singers. NRS is dedicated to providing opportunities for many groups to enjoy their music. In addition to this public concert, NRS performs at several area nursing homes. Some of the proceeds from the concert will support the NRS music scholarship program for young people in the area. Last year the award went to a scholarship for Bangor Children’s Choir. This year the grant will go to students participating in the Maine Summer Youth Music program at the University of Maine. “It is our goal to ‘pay it forward’ so that young people will have the chance to experience the joy of choral singing, and will be able to perform in choirs in the future,” says NRS Board President Tricia Griffith.